Webster’s New Collegiate Dictionary defines an arboretum as a place where trees, shrubs and other plants are cultivated for scientific and educational purposes. 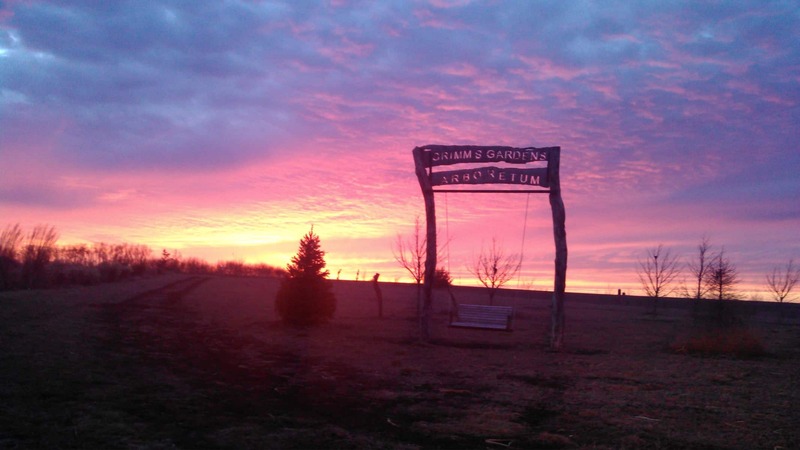 Grimm’s Gardens arboretum consists of approximately thirty acres of former row-crop ground, having grown corn, soybeans, milo, winter wheat and alfalfa for well over 100 years. In 1985, the first of this ground was taken out of crop production and seedling trees of hackberry, red cedar, Austrian pines, and autumn olives were planted to form a shelter belt north and west of the residence. Ten years later after having planted many fruits, vegetables and constructing greenhouses for commercial tomato production, more shelter belts were added. In some of these burr oaks, red oaks, white oaks and scarlet oaks were planted for large deciduous trees. This was the beginning. Early on it was very easy to see that these seed-grown trees of different species planted in rows spaced 15-20 feet apart in very similar soil grew differently – some fast, some not so fast, some developed acorns and seeds at a young age, some many years later. Some developed great fall color, some held their leaves into the winter and others did not. Having been a row-crop farmer and Pioneer hybrid seed dealer and running many on-farm test plots, we decided to start planting a tree test plot which has grown to include many shrubs, roses, grasses and perennials. Since the early years of this arboretum, we have planted extensive plantings of oaks, maples, elms, as well as many other species of trees in smaller numbers such as lindens, gingkos, locusts, hackberries, zelkovas, crabapples, cherries, poplars, beech, birch, catalpas, dogwoods, Kentucky coffee trees, ash, walnuts, yellowwoods, golden raintrees, mulberry, flowering pears, sycamores, tulip trees, magnolias, willows, and bald cypress, cork tree, rubber tree, larch, fir, spruce, pines and arborvitae. We have a very large viburnum test going on with approximately sixty different viburnums growing. All of our plantings are watered good when planted in the fall, and then any additional watering is only used the following summer if it is extremely dry. Some years we have not had adequate time or resources to get this accomplished and have lost some trees due to drought stress during the first year of establishment. This has proven to be one of the earlier benefits of our arboretum, as we have been able to determine that the Acer platanoides ‘Royal Red’ all survived through their first summer of establishment, whereas the more commonly used ‘Crimson King’cultivar, planted the same time and under the same conditions and from the same bare root source, all died. This is just one of the many examples of things we learn in an arboretum. We are currently using GPS mapping as a way to track all of our trees. It is our purpose in developing this arboretum that it will not only be an educational place to learn about how trees grow and which trees grow best in our climate, but that it can also be used as a park for people to exercise themselves and their pets and enjoy the beauty of nature and gather the health benefits of exercising in a forested environment that is very inviting as well as soothing to one’s inner self. We invite you out to view the arboretum for yourself! We live in a very fast-paced society today with little time and very few places to truly be able to get away and unwind from the noise of the interstate or the busy highways. Our setting in the country is truly a country farm. We hope you can take time to come relax, unwind, and enjoy—and maybe even learn a little about trees—for “Life is a shade better under a tree”.